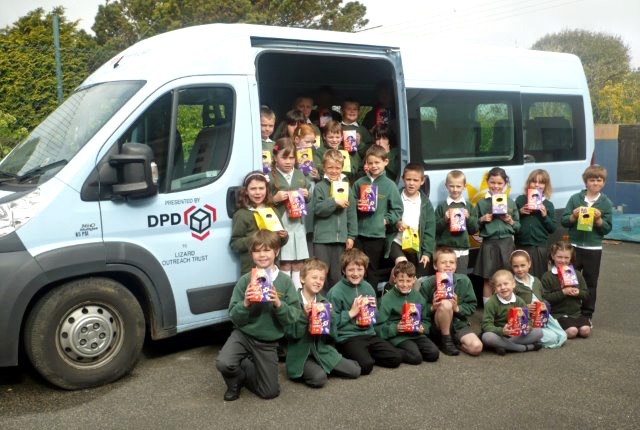 In April 2011 LOT received a new Variety Club Sunshine Coach which was sponsored by DPD Interlink, with supporting donations from Helston Rotary Clubs, Landewednack Primary School, individuals and Boex Studio Garden (click HERE to view invitation). 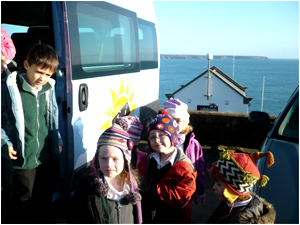 On the 27th January 2012 Landewednack pupils helped to celebrate SOS Day for the new Lizard lifeboat and station. LOT's Sunshine Coach has been put to very good use. Often the journeys undertaken are very short, but in most cases these journeys would not have been possible at all, due to lack of suitable public transport: on wet and windy days it is so good that the coach is on hand to jump into! Adrian always ensures that the coach is clean and cared for and Paul at Kynance Garage checks it regularly. LOT had the opportunity to acquire a Variety Club Sunshine Coach in 1997; the minibus with a tail lift, was intended to help LOT deliver activities in the community, and to include children with disabilities. The Golf Section of the Variety Club provided the bulk of the money needed, with Safeway’s South- West making a donation of £2000; LOT was asked to contribute £2000, but did not have this amount of money. Thanks to the generosity of Mullion Golf Club, LOT was able to raise the amount. The Club offered LOT the course for a day, free of charge, to run a competition, which would be followed by a raffle in the evening, when prizes were given. Having acquired the minibus, the golf club then allowed the golf competition to become an annual event; the proceeds cover the cost of tax, insurance and maintenance. The Variety Club asked if LOT would like a second Sunshine Coach, without tail lift; in March 2001 this minibus was presented to us. Our contribution was £4000, so LOT was especially grateful to Mullion Golf Club for their continuing generosity. All the staff and members are amazing in their corporate and individual support. LOT has a partnership arrangement with the ever growing Junior section of the club. Mullion Golf Club again generously hosted a Golf Day Competition, which raised funds for the upkeep of our Sunshine Coach. The 20th Golf Day will take place on Monday 29th May 2017. This will in all probability be our last Golf Day because LOT transferred the ownership of the minibus to Landewednack School . Mullion Golf Club again generously hosted a golf day, which was again a very happy occasion for members and visitors who played and helped us to raise funds for the running costs of the Sunshine Coach. This was the first time at the changed date of Bank Holiday Monday; as it proved successful the next Golf Day will be on Monday May 30th 2016. Click for 2016 Flyer. Our 18th annual competition at Mullion Golf Club was a success in every way: the weather was wonderful and the course was in very good condition. 26 teams of 4 set out at different times in a Texas Scramble Competition; this format is tailor made for fun and enables all players to be included. Teams included members and visitors With entry fees and raffle, the cost of insuring the minibus for another year was covered. In recognition of the club's generosity, LOT does not charge Mullion Juniors for use of the minibus for their competitions. The Golf Club has invited us to use the club course again and suggested that the day is moved from September, which has become a very busy month on the golfing calendar. So, a new date for your diaries please MONDAY MAY 25TH 2015. The golf competition took place in glorious sunshine; the warm welcome was also felt in the club itself, whose members have been so supportive and encouraging over the years, since 1997 in fact. 2013 was the 17th year of this competition. A decision was made to change the format of the completion; for the first time it was a Texas Scramble and since it was so well received we plan to do the same next year. The Club has already invited us for 3rd September 2014. 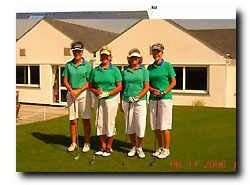 The same Ladies Team won for the second year running. The winning men's team was D.Reid, R.Spencer, J.Peters, S.Lester. Dale Wilson was the master raffle winner! We are very grateful to all the organisations which generously donate prizes. Tickets for the raffle are only sold in the clubhouse on the day of the competition, so we all know the winners! Gill Bayliss organises the raffle. The club Juniors continue to use the Sunshine Coach for their competitions, especially those further afield. Tony and Gill Bayliss who have responsibility for the Juniors clocked up several hundred miles in the minibus this year. The generosity of staff and members allowed LOT to run its 16th annual golf day (view flyer). Proceeds from the day contribute to the running costs of the Sunshine Coach. 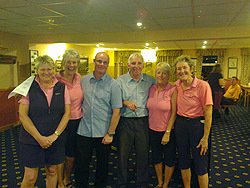 The winning Ladies team was the lady Captain Sally Markham, with Helen Carson, Sharon Moyle and Margaret Howells and the Men's team was Daniel Reid, Ben Wilson, Rupert Spencer and Simon Lester. As in previous years, both the Club Secretary and the Captains (seen in this photo) gave tremendous support and help. Gill and Tony Bayliss, who help LOT to run the raffle, put in many hours in all weathers as they undertake responsibility for the Juniors. This year we received significant support from Barclays Bank Business which match funded. Tom Watson generously donated a signed cap for auction. The course was at its best and everyone was encouraged by the fantastic, beautiful weather! There was an enthusiastic entry of 132 in teams of 4. The strong breeze was a problem for some but most of us stayed dry and there were there some impressive scores. It was a very warm and genial occasion, very well supported by the members and with generous donations for the raffle from local restaurants and other businesses. The Trust raised £1,355 on the day. This supports the Trust's work on promoting educational opportunities to promote and facilitate improved self esteem and employability amongst youngsters on the Lizard peninsula. The golf club has been very happy to support this great cause for several years now. Winners of the Ladies' teams competition were Pamela Stanley, Gill Bayliss, Marianna Gush and Alison Meagor with 96 points. The second team on 92 points were Rebecca Gush, Elaine McCorkill, Liz Shone and ladies captain Liz Whittaker on 92 points with Sharron Moyle,Margaret Howells, Helen Carson and Sally Markham with 81. The leading men's team amassed an overwhelming 118 points. They were Ben Wilson, Rupert Spencer, Dan Reid and Pete Mackley. They left the second and third placed teams behind on 109 points. With a superior back 6 James Coventry, Alan Retallack, his son Kelvin and Nigel Norton prevailed over Denis Law, John Kew, Glyn Summersall and Wilf Hutchinson. The ladies longest drive on the 18th prize was won by Rebecca Gush. The men's was won by Kelvin Retallack. Nearest the pin on 11th was Pamela Stanley. On the 16th hole Ben Wilson was just nearer (at 2ft 5in) than his father Dale. We had a marvellous day. The club is looking forward to hosting the event again next year. Dr.Ken Whittle Club Captain. The minibus is now suffering from rust in too many areas and will soon need to be replaced. 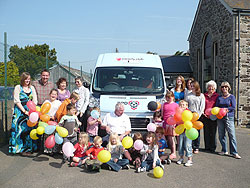 The 2010 competition will be when we start to raise the £10,000 needed as a contribution towards a new minibus. We were indebted to our local golf club once again this year when we had the courtesy of the use of Mullion Golf Course for our 14th annual day of raising minibus funds in an open golf tournament for club members and for team entries from far and wide. We were blessed with wonderful weather and a course in magnificent condition. The golf was played in teams of four in a stableford points system with 2, 3 & then 4 players to score on 6 holes each. In the men's/mixed competition the winning total was 112 points from C.Piper, G.Davis, A.Trerise and R.Casley. 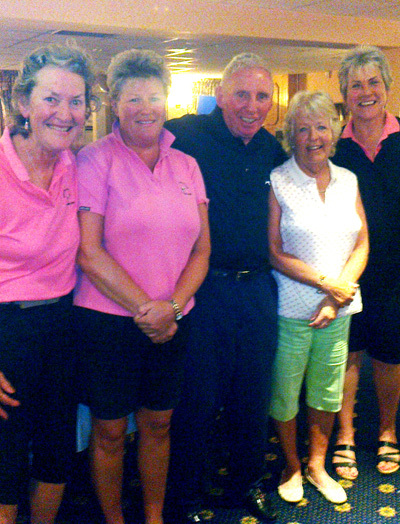 The Ladies' competition was won on 101 points by R.Gush, M.Gush, E.McCorkill & G.Bayliss. We had a good entry again and some handsome donations from stalwart supporters of the Charity. The Juniors entered 2 teams; the date coincided with return to school or college. The day is vitally important to us as we are now in the throes of attempting to raise enough money to allow us to go to the Variety Club for a replacement minibus as our Y reg one is now rusting away and costing us very dearly on maintenance. We continue to have very close links with the Mullion Golf club juniors. It has been a real pleasure to witness the success of the juniors throughout the season with the excellent guidance of Tony & Gill Bayliss. The juniors have had full use of the minibus for their travel at only petrol cost. We congratulate all their youngsters on an outstanding year and are very pleased that we, as a local charity can contribute to their progress. It is hoped that we may become more involved at weekends with the ever increasing young golfers coming along. We thank everyone who has contributed in any way to the success of our day this year. 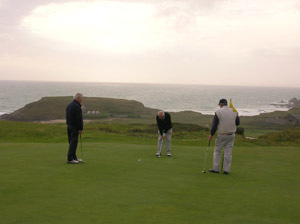 We look forward to our day in 2011 on September 7th with the very kind consent of Mullion Golf Club. With the backing of Alison Hallett & Barclays Bank we will have raised around £1600. Well done everyone & thank you again. Unfortunately, the weather was the only real winner on the day; it was awful! Only a few teams battled all the way round, but Mullion Golf Club Captain Bob Oxford did award all the prizes on LOT's behalf. The clubhouse was full for the presentations, and many players who were deterred by the weather nonetheless made generous donations. £430 was raised for expenditure on LOT's Variety Club Sunshine Coach. The Juniors' raffle was also well supported; this money offsets travel costs to tournaments. Mullion Golf Club invited Lizard Outreach Trust to organise its annual golf competition, to raise funds for the running of its Variety Club Sunshine Coach. The day was a huge success, raising around £1800. There were many players from many clubs, Exeter, Taunton, Burnham, Bowood Park Wiltshire, Cheriton Bishop, Leamington, St Enodoc, Truro, Falmouth, Killiow, Cape Cornwall: the most distant club was represented by a young man from Perth, Australia. 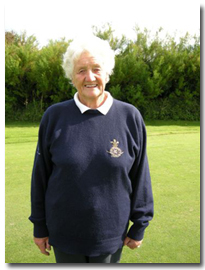 A special competitor, particularly given the challenging weather, was 84 years old Jo Trapnell from the Royal North Devon. The weather was kind in giving sunshine but not so kind with the howling wind that blew for most of the day, keeping scores low. In total there were 2 Junior teams and 37 in the main competition. 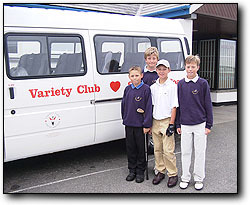 The Junior section of Mullion Golf Club organised a terrific raffle for their funds: they benefit greatly through their access to this minibus. The day is an important one in the calendar for LOT as it not only raises money for the upkeep and running of the minibus, but also keeps the contact and communication with local people and supporters. The day started at 8.30 a.m. and ended with the presentation of prizes in the clubhouse at 8pm. Peter Moyle Captain of the Club presented prizes. The main event was run on a Stableford points system with different scoring throughout the holes. LOT is very grateful to Mullion Golf Club, Gerry Fitter and all the officers, the members and the Junior section for their continued support. The annual golf day organised by the Lizard Outreach Trust at Mullion Golf Club was the normal very pleasant and exciting contest. The day is an important one in the calendar for the Trust as it raises money for the upkeep and running of the Variety Club minibus as well as being contact and communication with local people and supporters. The Junior Section at Mullion Golf Club benefits greatly through their access to these buses. The day started at 8.30am and ended with the presentations at around 8pm in the clubhouse with Martin Crampton Captain of the Club distributing the prizes. During the presentations LOT introduced their new Full time Youth worker - Russell King who will hold the position for 5 years. The Junior section event took place during one of their regular Saturday morning sessions. The weather for them was very good. The competition was run over 18 holes. Thanks go to those Juniors who participated and to the senior organisers of that section too. The winners with 82 points were Alan Lieske, Max Irwin & Keenan Foster , with the Tom Neal, Becky Pitt & Daniel Kelsall in 2nd place on 77 points. There were 18 teams in the main event, on a Stableford points system with 4 to count holes 1-6, then 2 on 7 -12 & 3 to come in on the back 6. The Junior section at the club organised the raffle and the auction of a signed Real Madrid shirt & a Pirates Rugby ball. They raised a magnificent amount. The Junior section and members for their continued support. The highlight of the day was undoubtedly the spectacular hole in one by Nigel Hannaford on the 16th. Nigel has supported the charity throughout and it was a very real pleasure to present him with a celebratory bottle of champagne. The 9th annual golf day organised by the Lizard Outreach Trust at Mullion Golf Club was another outstanding success. The day is a very important one in the calendar for the Trust as it raises money for the upkeep and running of the Variety Club minibus as well as being a personal contact with local people and supporters. It is a very needy cause for the annual running costs increase each year. There were 27 teams in the main event. This was run on a Stableford points system with 3 from the team of 4 to count on each hole. The Junior section at the club organised the raffle and the auction of signed premiership footballs and raised a magnificent amount of £800. The overall amount raised for the trust was around £1600. The Trust is very grateful to Mullion Golf Club, Peter and Sharon Moyle, Gerry Fitter along with the officers and members for their continued fantastic support. 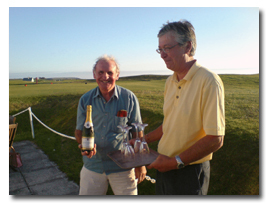 The 2004 annual golf day was held at Mullion Golf Club on Wednesday 24th August. There were 4 Junior team entries and 24 adult teams. Some of our very promising youngsters played in the main event. In fact the team of Alex & Michael Cook, Leo Acklin and Daniel Wagstaff came third with a score of 108 points! The first prize in the competition went to a visiting team captained by former County soccer player Duncan Powell from St Austell. Other prize winners were the Navy quartet of Simon Lewis, Gary Davis, David Howe and Nigel Thwaites(3rd), with S.Willett, N.Watters, M.Hitchens and Helen Carson (4th). Nearest the pin prizes for 8th & 16th holes went to Ben Wilson and Richard Lane with David Howe picking up the prize for the longest drive on the 18th fairway. Beau Meagor won the two Chelsea match tickets in the free draw. The weather on the day was kind except for a most difficult wind. It was, as usual a most pleasant “local” day with excellent support for this very local charity. Since these days were initiated in 1997 somewhere in the region of £7,000 has been raised. Quote from Young People: "It's a great competition - we often do better than lots of the adults!"